Ryder (r), with RNC successor Webb in Memphis on Thursday. 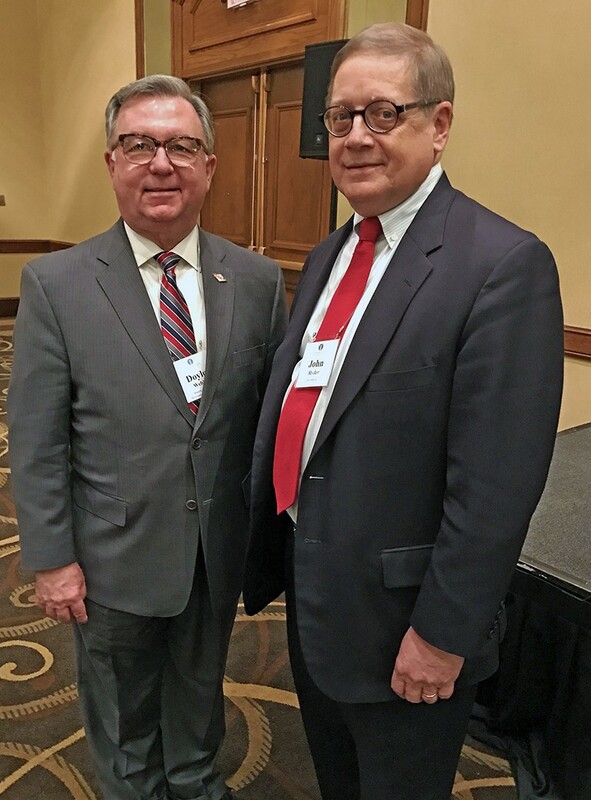 After serving as RNC general counsel from 2013 on, Memphis lawyer John Ryder has left that position, yielding it to Arkansas Republican Party chairman Doyle Webb, who appeared with Ryder at a Thursday luncheon of the Economics Club at the Memphis Hilton. Ryder now becomes chairman of the National Republican Lawyers Association,which awarded him its "Republican Lawyer of the Year" in 2016. Before become RNC general counsel, Ryder had served in a pivotal role as the chair of the RNC's national redistricting effort after the 2010 census, providing strategic guidance for a reapportionment formula that has maximized Republican electoral opportunities nationwide — particularly in the U.S. House of Representatives. A member of the Harris Shelton Hanover Walsh law firm, Ryder has also served as chairman of the Shelby County Republican Party, among other GOP posts, and has logged a total of 16 years as Republican National Committeeman from Tennessee.